Shirin Ebadi is the first Muslim woman to win the prize. 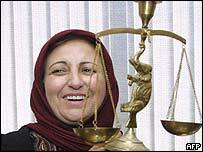 Speaking at a news conference in Tehran, Mrs Ebadi said winning the prize had laid a heavy burden on her shoulders. She said that she now felt she had to prove, if only to herself, that she was worthy of the award. Despite the wave of support for her, Mrs Ebadi made it clear she is not planning to enter the political arena and seek power. Mrs Ebadi pledged to step up her activities and those of her NGO, the Centre for the Defence of Human Rights. One of the main activities of the centre is representing defendants in political cases. She said her top priority would be to press the government to put into practice the many international conventions on human rights which it has signed but not implemented. She also expressed the hope that political prisoners in Iran would be freed as soon as possible. However, Mrs Ebadi made it clear she had no such thoughts. She was committed to struggling for human rights, she said, and that had to be done from outside the establishment, because it was governments which trampled on people's rights. The job of human rights activists was to speak for those who had no voice. 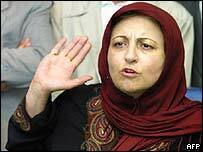 Mrs Ebadi's award has continued to stir the political waters in Iran. Right-wing papers denounced the prize as part of a foreign plot to pressure Tehran. The papers seized on remarks by the reformist president, Mohammad Khatami, saying that the award was political and not important. With general elections just around the corner, this apparent closing of ranks between moderates and hard-liners within the Islamic system is unlikely to improve the reformists' already dim prospects.